The YouTube sensation will appear as an NPC. YouTube sensation Shirley Curry, also known as 'Skyrim Grandma', will be immortalized in The Elder Scrolls 6, Bethesda has announced. Curry will appear in the game as an NPC as the result of a fan petition, as revealed during The Elder Scrolls 25th anniversary stream. The petition recorded over 45,000 signatures (and is still getting more by the hour) and Bethesda clearly took notice. "This means a lot to me," Curry says in the anniversary video (at the 8:40 mark), "because I would be extremely happy to know that somebody else was playing with my character in a future Elder Scrolls game." In the video you can see Curry being photographed and scanned into the computer for artists to create a virtual version of her. 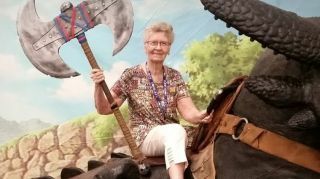 Curry became an internet celebrity at around 80 years old after posting videos of herself playing Skyrim on YouTube. When one of her videos was posted to Reddit, she woke up the next day to find over 11,000 emails from people who had watched it. "It scared the puddin' out of me," she said of her newfound fame when Steven interviewed her in 2016. But she quickly settled into her new role as a gaming celebrity, and when The Elder Scrolls 6 comes along (whenever that might be) all her fans will finally be able to meet her—or at least her avatar.